Rescue workers look at the crash site in Plaridel, Bulacan, north of Manila. Photo: AFP. 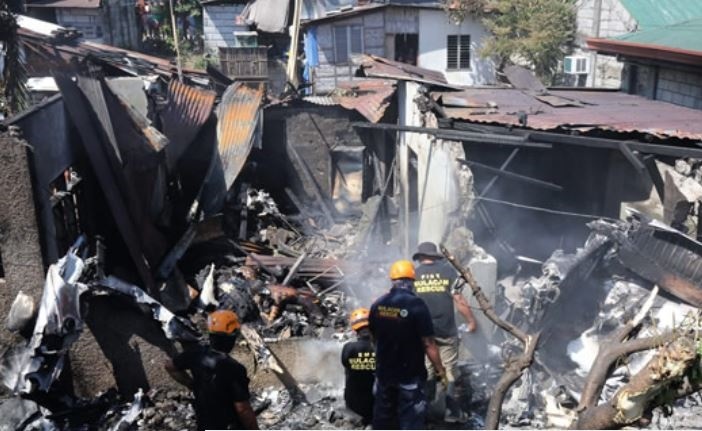 At least seven people were killed when a small plane crashed into house while trying to take off just outside the Philippine capital on Saturday, police and aviation officials said. The twin-engined aircraft crashed into a house just after taking off in Plaridel town, killing all five aboard as well as at least two people others on the ground, said Superintendent Julio Lizardo. The death toll could rise as rescuers were still going through the ruins of the house, Lizardo, the town’s police chief said. “We are still digging through the rubble. There may be more dead,” he told AFP. Officials declined to say what may have caused the crash of the Piper PA-23 Apache operated by a local charter company.